The Nectar mattress is classified as a 4-layer mattress that contains a gel-infused memory foam layer as well as a dense, foam core. It can be difficult to find a bed frame that works well with a mattress as good as the Nectar. We’ve made it easy to pick by listing the best bed frames for the Nectar mattress. This mattress foundation is great for the Nectar mattress because it is made of metal, which offers extra stability to support the mattress overall. 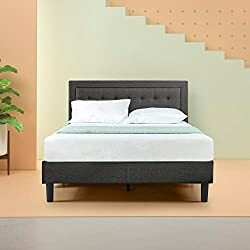 In addition to this, the bed frame supports the mattress with slats, which is the best kind of bed frame for memory foam mattresses because this allows the cushioning from the mattress to fit between the slats. The Zinus Elite SmartBase Mattress Foundation also offers a sturdy foundation, eliminating the need to purchase an extra box spring to support the Nectar mattress. This bed frame presents a folding design that allows you to transport it through hallways as well as staircases easily. Additionally, this frame is noise-free and non-slip. The product is smartly shipped because the frame is folded into a thin box and is delivered directly to your doorstep. The dimensions of the product are 38 x 75 x 14 inches and it weighs 25.8 pounds. Since there is 14 inches of space underneath the frame, this also allows for extra storage space under the bed if needed. This bed frame works great with the Nectar mattress because it contains both metal and wood support, which allows for the frame to give off a modern look as well as offer maximum support for the Nectar mattress. The wood slat support also allows for the mattress to last longer as well. Furthermore, this bed frame can be easily assembled and offers a cherry-finished pinewood headboard. 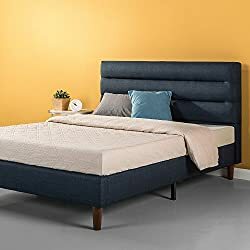 In addition to this modern headboard, the bed frame also offers a sleek metal structure, which altogether provides the user with a contemporary, modern look in their bedroom. This product contains both foam-padded tape as well as non-slip tape for the mattress. The foam-padded tape allows for the bed frame to not give off any noise when being used, and the non-slip tape prevents the Nectar mattress from moving around on the wooden slats. This product also comes with a 5-year limited warranty. The dimensions of this product are 80 x 59.5 x 7 inches and it weighs 86 pounds. This bed frame is great for the Nectar mattress because it contains wooden slats that have the ability to support the Nectar mattress and distribute its weight evenly. This provides the user of the Nectar mattress and the Zinus bed frame maximum comfort. In addition to this, the bed frame presents a classic style and is made from dark grey upholstery. It also contains diamond stitching, which gives the fabric optimized durability. This product is shipped conveniently because all of the parts contained in the frame are shipped in a zippered compartment that’s located behind the headboard of the frame. Furthermore, this bed frame is noise free, since it contains foam padded tape. The dimensions of this product are 80 x 63.4 x 40.7 inches and it weighs 79.4 pounds. Also included in the purchase of this bed frame is a 5-year limited warranty if you purchase the king size. This bed frame works great with the Nectar mattress because it contains wooden slats, which support the Nectar mattress, promoting its distribution of weight evenly. Not only this, but this bed frame also presents a contemporary design with the tufted headboard and footboard. The slat system that’s included in this product is classified as a bentwood slat system, which means that there is maximum ventilation presented to the Nectar mattress. The slats allow air to pass beneath the bed frame and ventilate the mattress. This bed frame also includes side rails and additional legs that can be added if needed. Furthermore, this bed frame can be assembled in minutes, since the package provides clear instructions. It’s shipped in one package, which allows for easy transportation. The dimensions of this product are 64.5 x 80.5 x 39.5 inches and it weighs 87 pounds. This bed frame is great for the Nectar mattress because it contains wooden slats and non-slip tape on the slats. This tape prevents the Nectar mattress from moving. Not only this, but this product also contains foam-padded tape on the steel frame. This tape allows the bed frame to not make any noise. In addition to all of this, the bed frame can be easily assembled in minutes. This bed frame presents sturdy wooden slats as well as 3 center legs that offer additional support. The support that this bed frame offers eliminates the need for the user to have to use a box spring, especially by using the Nectar mattress as well. Furthermore, this product comes with a 5-year warranty and presents a modern, natural finish. The dimensions of this product are 79.5 x 59.5 x 14 inches and it weighs 53.9 pounds. 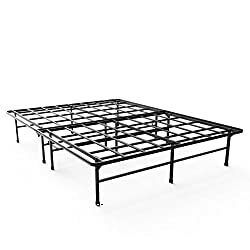 This bed frame is great for the Nectar mattress because it contains steel slats, which offer maximum support for the mattress to be founded on. This bed frame offers a high-quality powder paint finish that presents a modern look to a bedroom. Moreover, this product contains a solid metal frame structure, which creates additional support for the Nectar mattress. This product can be easily assembled, since it includes all of the parts needed and it is shipped conveniently in one box. The purchase of this product comes with a 5-year limited warranty in which the company offer 100% services to ensure that this bed frame works well with your Nectar mattress. The dimensions of this product are 60.43 x 83.54 x 43.5 inches and it weighs 65 pounds. This frame offers 12 inches of under-bed storage for the user to store clothes, blankets, or other items in their bedroom. This bed frame is great for the Nectar mattress because it offers wooden slat support for the mattress. The wooden slats offer the best kind of support for the mattress as well as room for the mattress to ventilate. By allowing the Nectar mattress to ventilate, the life of the Nectar mattress is elongated. Not only this, but this bed frame also offers an upholstered headboard as well as a linen platform, which all provides the user with a bed frame that offers a low profile. Furthermore, this product also provides the user with easy assembly, since it comes conveniently shipped with all of the materials needed located in a compartment behind the headboard. In addition to this, the product only weighs 80 pounds. Overall, the Nectar mattress offers great innovative technology that provides its user with maximum comfort, while also providing many health benefits. But this mattress’ effectiveness is largely based on the quality of the bed frame that it’s placed on. After reading this guide for the best bed frames for the Nectar mattress, hopefully you have more direction in choosing a bed frame that works well with both your Nectar mattress as well as your bedroom theme.